We had a visit from Roma’s friend Evelyn Barker today. She has a house in Leucate that she is staying in for the summer. I have met her a few times, but this is the first time we’ve chatted – nice lady. 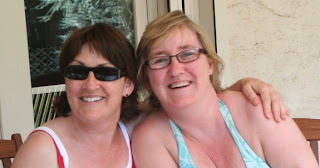 We had a long lazy lunch – Evelyn doesn’t drink alcohol, so it wasn’t a boozy lunch, we had a good laugh. It was late in the afternoon when she left so we just headed for the pool and a few games of volleyball. While these games are little competitive, they are great fun and we switch around teams all the time. Emma seems to win most, so all want to be with her! It was another beautiful day though there are some clouds about for this evening. The forecast for the weekend is mixed – if I’m travelling I think I can expect some rain along the way. Of course I still have no idea when I’m going – while I was expecting a call from HOG Assistance today (which did not happen) I decided to try to put the whole thing to the back of my mind and not to contact Macadam Moto until tomorrow. The consequences of a delay past Saturday are that my two hotels and two car ferry bookings for the trip home will have to be cancelled - probably with little or no refund at this late stage. Not to mention the extra cost of staying until at least next Tuesday. In any case, tomorrow will be decision time – I have also my appointment with M. Bockmann in Cherbourg on Sunday to consider.